Today's update of the #GE2017 Forecast came with an update to the redistribution of UKIP votes section of the 'polls plus' model (whereby votes are sent to other parties in seats where UKIP have withdrawn). This section of the model now incorporates every constituency where UKIP are now standing aside (where they previously stood in 2015) in favour of the Conservatives, and the redistribution of their votes has been recalculated to reflect recent analysis conducted by Chris Hanretty of British Election Study data. 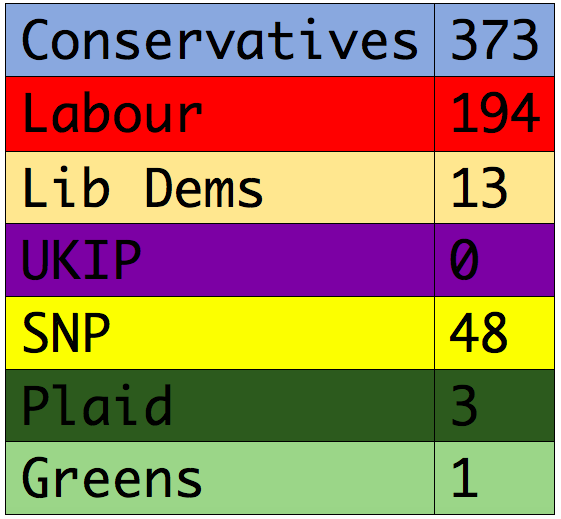 Conservatives 376, Labour 190, Lib Dems 7, UKIP 0, SNP 55, Plaid 3, Greens 1. This sizeable cut in the number of projected gains for the Conservatives reflects something of a revival recently in the Labour Party vote share across national polls. The 7-day rolling swing estimation (which both models use to predict seats) has Labour now just 0.3 points down from their 2015 result. The story of this election seems to increasingly be solely about where those UKIP voters are going (over half of them appear to have already ditched the party, according to the polls), as opposed to any Labour to Conservative swing. 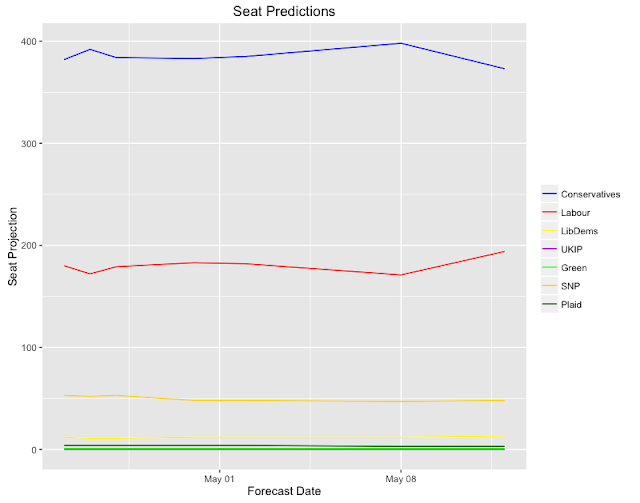 The result represents Labour's highest seat projection of the forecast to date, reflective of a gradually declining swing away from the party in the polls since late April. 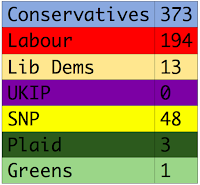 It still projects however a healthy Conservative victory, giving them a majority of just short of 100 seats (96). The forecast tracking graph shows the extent to which the gap between the parties has narrowed - not much in the grand scheme of the result, but certainly a significant shift in the projections. 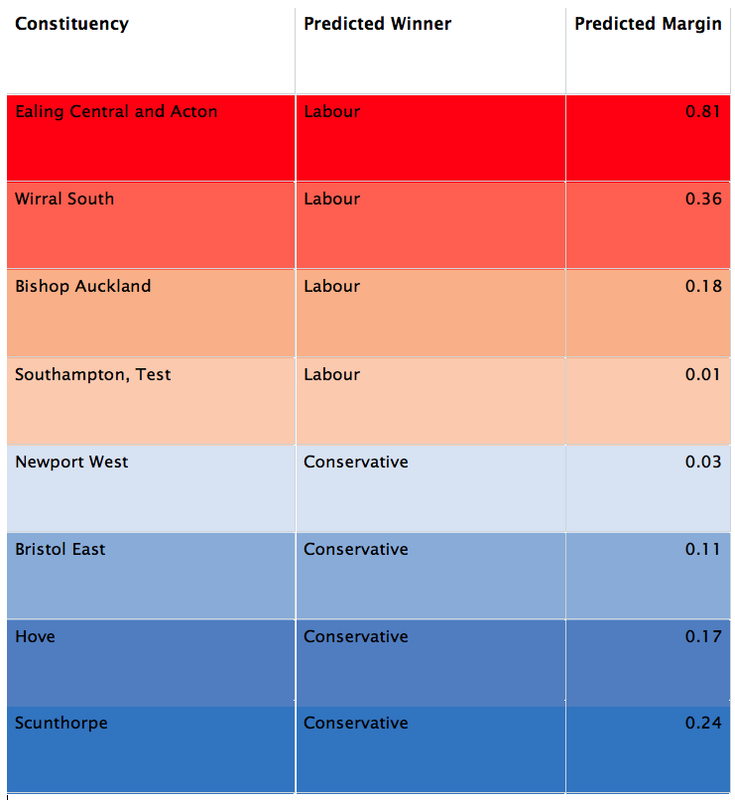 The 'polls plus' model now projects the Conservative swing into Labour seats to stop at Southampton, Test. Ealing Central and Acton is projected to remain in Labour hands again for the first time since this feature of the forecast began. Chorley would also remain in Labour hands according to the model were it not for UKIP's withdrawal in the Lancashire seat, which is expected to push the Conservatives over the line there. The news is certainly positive for Labour from a relative perspective, but they are still far from seriously denting the prospects of a significant Conservative majority in the House of Commons come June 8th.